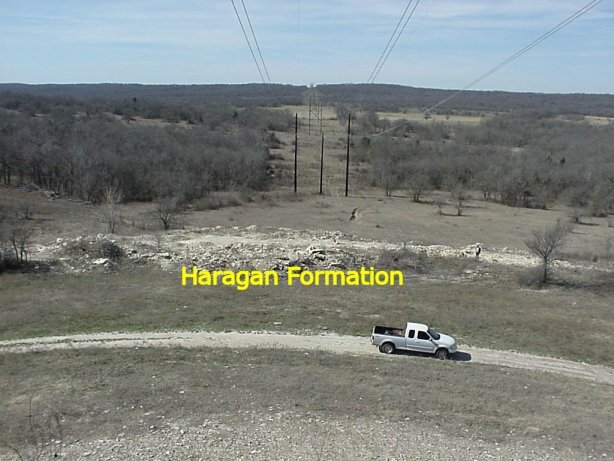 Oklahoma is remarkable in terms of its representation of formations spanning much of geological history. The Paleozoic is also well-represented, and some of the most spectacular trilobites that originate from within the boundaries of the United States come from Lower Devonian formations in Coal County, Oklahoma, located near the tip of the white arrow on the map (click the map to enlarge). This map correlates location and age of the Oklohoma geology. Closest to the Devonian Haragan and Bois d' Arc fformation is the town is Clarita, which amounts to little more than a few humble residences and a post office. 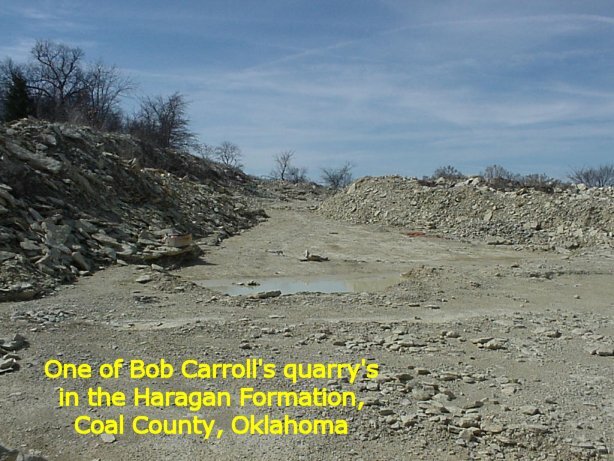 Three commercial quarries operate and supply a steady, if sometimes minimal, supply of 19 different trilobite species. 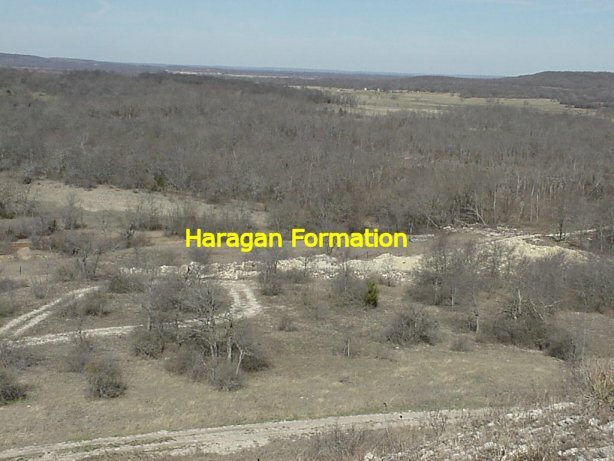 The two primary formations are the Haragan and Bois d' Arc, with soft limestone that yields with proper equipment and skilled operator beautiful honey-colored trilobites of a shade and quality resembling those from the Saint Petersburg region of Russia. 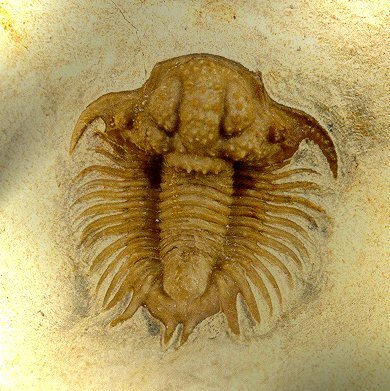 Interestingly, the Devonian trilobites of Oklahoma have look-a-likes found in the Atlas Mountains of Morocco. While today on continents separated by thousands of miles, such was not the case during Devonian-time. During the Devonian, present-day Morocco was part of the Eastern continental shelf of Gondwana, and present-day Oklahoma was part of the Southern continental shelf of Euramerica. These locations were adjacent and at essentially equal latitudes and probably had nearly identical environments. Thus, each of the comparable species undoubtedly shares a common ancestry and is classified in the same genera. The Table below lists the species found in Devonian of Oklahoma, as well as information on classification and relative frequency. Mr. Robert Carroll has operated one of the commercial quarries in the area for the past dozen years. 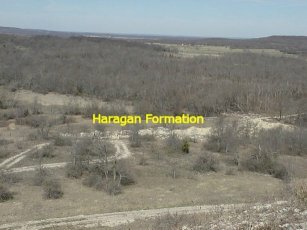 Actually, he works several quarries that have exposures of both the Haragan and Bois d' Arc Formations. 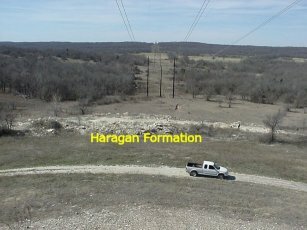 I have hunted in these quarries, and the process is markedly different from hunting the Great Basin in the Western U.S. While surface hunting is possible for trilobites weathering out of matrix, if your goal is an exquisite specimen, you'll have to do a lot of rock splitting. The trilobites are discovered by their very thin cross sections (hence, the trilobite will already be in two or more pieces). 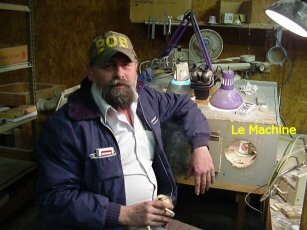 Expert eyes like Bob's are usually required to ID the species and to estimate whether it is possible that the matrix may contain a complete specimen. Most are not complete. If it can not be determined that it is incomplete, the next step is to take it back to the prep lab and rough it out with a pneumatic chisel. The exception is the complete specimen which is then finished using air abrasive tools. The trilobites that come from Bob's lab are exquisite in every respect, and each one represents prodigious hours of preparation. The good news is that the limestone matrix melts away under AlO2 grit at 100 psi pressure, yielding a life-like specimen that is a darker brown than the matrix. The picture below shows Bob setting by his circa 1953 White air abrasion machine. As old as it is, it is meticulously maintained. 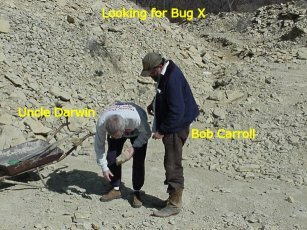 Bob's preparation is a source a pride, and examples of his work can, for example be found in Riccardo Levi-Setti's book, Trilobites. The Table below lists the 20 Devonian trilobite species found to occur in the Haragan and Bois d' Arc Formations, Links are also provided where you will find more information and pictures for many of the species. Some of these trilobites are exceedingly rare and and only known from fragments. 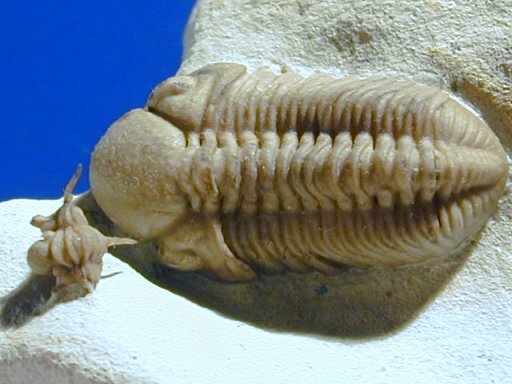 In this case the species listed is a similar trilobite occuring elsewhere. Cyphaspis carrolli, a diminuative Aulocopleurid, is named for Bob Carroll. 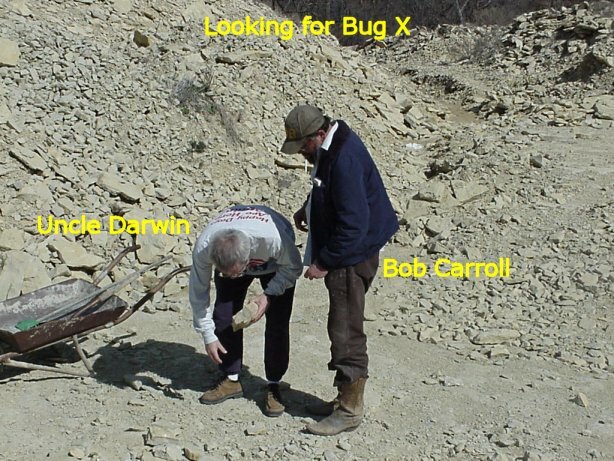 Bob is also credited for the discovery of a rare petite lichid trilobite recently determined to be Acathopyge consanguinea (also knoen from New York), and which Bob affectionately called Bug X. As previously mentioned, Morroco and Oklahoma were proximal during Devonian time, such that some trilobite genera are common to both Coal County and the Moroccan Atlas Mountains. The Oklohoma species tend to be smaller and, I believe, more elegant. A perfect example is the highly sought Odontopleurid genus, Dicranurus. 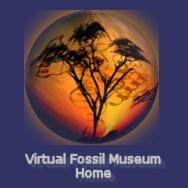 The Morrocan species is named Dicranurus monstrosus, (a favorite among the fake fossils producers of Northern Africa) and the Oklahoma species Dicranurus elegantus - it appears that the names pretty much tell it all.